It is eight years since Jonah Keri’s The Extra 2% was published and over a decade since the remarkable 2008 season it was based on, and a lot has changed in Tampa Bay. Andrew Friedman has taken his talents to Los Angeles, where he could do with that two percent as the Dodgers keep coming within a whisker of winning it all, and Joe Maddon left to win a World Series of his own but lost some of that sheen as the great managerial innovator. Even Evan Longoria, face of the franchise on a team that carried very few familiar faces from season to season, was no longer in their uniform last year. One thing didn’t change: the Rays found a way to do something no-one else was doing and turn it to their advantage. The Opener became one of the biggest stories of the 2018 season, marking the next step in the constant evolution of pitching strategy. With it, the Rays coped admirably with the loss of three starters, including top prospect Brent Honeywell, to Tommy John surgery, while also drawing more negative press for the notion that they were doing this simply because they were too cheap to sign better players to take those spots, or that it was an effort to keep arbitration raises down. It didn’t hurt that Blake Snell blossomed into a Cy Young-quality pitcher, and that Joey Wendle and Mallex Smith produced breakout performances. The Rays look more exciting on paper than they did at this point last year. Snell is no longer projection and hope, having assumed the mantle of bona-fide ace. Shortstop Willy Adames put up an exactly league-average DRC+ last year, which doesn’t sound that thrilling until you consider that he was just 22 and it was his first taste of the majors. The acquisition of Tommy Pham gives Tampa Bay a potential All-Star caliber starter in the outfield. They might already have one of those if Kevin Kiermaier can keep his transcendent glove on the field all year, or indeed two if Austin Meadows lives up to his prospect pedigree. The farm system is among the best in baseball, with Honeywell and Jose De Leon set to return from surgery at some point this year to contribute, while Brandon and Nathaniel Lowe will both play a role in the offense. Charlie Morton is that rare beast on the Rays, a multi-year free agent signing. He should save the arms of Ryan Yarbrough and Yonny Chirinos for an extra day each time through the rotation, if we can call it that, and the team will in turn use their deep, flexible bullpen to ensure he stays healthy. As much as the Rays might have improved their name value, their trademark has long been extracting the best from a collection of seemingly underwhelming parts. Perhaps they will gently nudge Yandy Diaz‘s swing plane upwards to produce a home run total more commensurate with his rippling frame. Have they got a plan for Avisail Garcia, cast aside by the White Sox but with flashes of premium production in both average and power on his resume? Most likely is that they will simply put both of them, and the likes of righty-mashing Ji-Man Choi, in the optimum spots to succeed, without asking any of them to approach a full season of playing time. The Rays rarely use the same lineup two days in a row, because they’re always looking for that edge, no matter how small. For all this optimization, they have yet to find a solution to their main obstacle: their ongoing residence in a division that contains both the Yankees and Red Sox. Short of relocation, that is a problem which is not going away, and it leaves Tampa Bay projected as the third-best team in the AL East once again, just as they were in each of the past two seasons. That extra two percent is a big deal, but it’s rarely enough to overcome not one but two teams with more resources at their disposal than almost any other organization. What is the Rays’ most recent accomplishment? 90 wins in a division that featured a 108-win team and a second-place club that broke the all-time team home run record is fairly impressive, but feels like a consolation prize. Snell’s Cy Young award fits the bill as a more standard accomplishment, even if it is a personal rather than a team award. After drawing Snell’s ire for the paltry $15,000 raise they gave him following this award-winning campaign, the team has perhaps placated their ace by signing Snell to a 5-year, $50M extension that covers all of his arbitration years and the first year of free agency, while still likely extracting some value and keeping their payroll down. Barring injury, Snell will clearly be worth more than that over that timeframe, and yet the arbitration system will make it impossible for him to top the value of the contract until he hits free agency. How will the Rays define success in 2019? Giving the Yankees and Red Sox a run for their money is one benchmark, although again it will hardly feel like a success if they fall short. A Wild Card spot is the more tangible and realistic target, and indeed where projection systems have them finishing. Significant development from the next wave of young talent will also be a boon, such as another recent extension recipient, Brandon Lowe, and the full-season debut of mercurial 18-year-old Wander Franco, who may well be baseball’s top prospect by this time next year if 2019 is anything like his stunning 2018 debut. Is this cheating? It feels like cheating. The capitals aren’t necessary: Glasnow is the most effectively wild player on the roster – assuming he’s effective, that is. However, Glasnow is Effectively Wild in the sense that he’s unique and possesses some ludicrous stats to back it up. He has long since been too good for the minors, as his 140 strikeouts and 1.93 ERA in 93 1/3 innings at Triple-A in 2017 demonstrated. The ongoing question has been whether he can harness his control enough to become a valuable major leaguer, and the 6’8″ righty seemed to convince many he had turned a corner after arriving in Tampa Bay last year. He struck out 64 in 55 2/3 innings while dropping his walk rate to a very respectable 3.1 per nine. DRA thought he was worse with the Rays, which isn’t to say he was bad: an 81 DRA- is still excellent, and he was exclusively a reliever for the first four months with the Pirates. Glasnow sits 97, touches 101, has a tremendous curveball, and generally looks like he should be an utterly dominant starter if he can just get his mechanics to co-operate. Only ten pitchers in the majors last season were at least 6’8″, and the two other regular starters – Brandon McCarthy and Doug Fister – just retired. The chance that Glasnow ends up like the rest of that list and becomes a full-time reliever still hasn’t dropped to zero, especially if his changeup never becomes a viable third pitch, but we seem closer than ever to seeing a truly effective, less wild Glasnow. The Rays have a most Effectively Wild employee, of course, but even Tampa Bay might draw the line at asking Jeff to throw a mop-up inning here and there. For the pun, the clear winner is April 20th, when fans will get a Ryne Stanek bottle opener. No word yet on whether Stanek will line up to start that game. 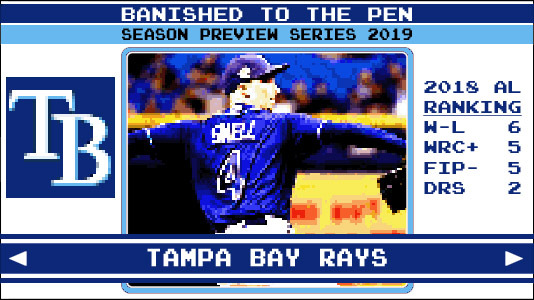 For the sheer surrealism that everyone’s looking for in a ballpark giveaway, March 30th is the best bet, when Blake “Snellzilla” Snell will be the subject of a bobblehead rampaging through the city as half-ace, half-monster. Why is he nicknamed Snellzilla, you ask? Well, he stole it from his brother, who presumably possesses more Godzilla-like qualities than the Cy Young winner, who is neither threatening nor a giant prehistoric monster. He’s tall, I guess, but not that tall for a pitcher (Glaszilla, anyone?). Look, I don’t know either, OK? They were kids. Nicknames make no sense sometimes.